If you are planning to spend an extended period abroad perhaps during the winter months when it's so cold at home or at a home you own abroad during the summer then you will need to take out a specific travel insurance which covers you for extended periods abroad. Our long stay travel insurance policies for Seniors provide comprehensive cover however it is very important that you choose a policy which provides you with the flexibility you need. You need to clearly evaluate what cover you need prior to purchase because many insurers won't cover you for multiple return trips to the UK for instance, with the policy expiring upon the date of your first return to the UK. Not ideal if you have to nip home for a surprise visit or to tend to an emergency at home. In addition, careful thought needs to be given to declaring your pre existing medical conditions. Whilst you will be covered in the EU with you EHIC card they are designed for emergency medical only and won't cover you cover and private care and repatriation back to the UK. 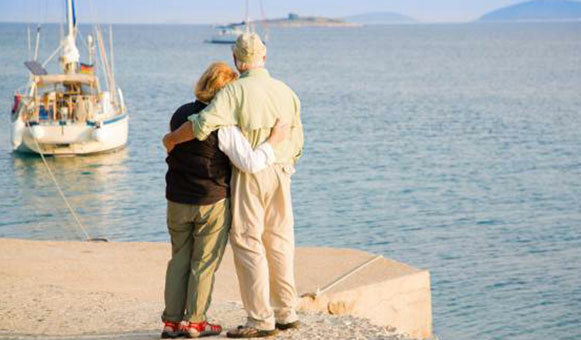 Our approach has always been to offer the traveller the choice when it comes to Seniors long stay travel insurance. Following a simple quote stage where we determine your needs, the policy options are laid out on screen in such a way that you can easily see what is covered and more importantly whats not covered under each policy. Comprehensive senior long stay travel insurance covers the policyholder for insurable events that may occur before or during travel, such as trip cancellation or journey interruption, medical expenses for injury or illness, theft of valuables, baggage damage and more. The cost of travel insurance is based on the type of cover requested, the age of the insured, the destination of travel, the length of stay, type of activities covered and whether you have any pre-existing medical conditions. We have a wide range of available travel insurance policies available to suit all needs. (1) Cover limited to the Standard, Premier, Premier+, Voyager and Voyager+ single trip and annual multi trip travel insurance policies.